Waiter corkscrew and other devices to overcome corkophobia! Corkophobia arises after a few embarrassing encounters with stubborn corks that refuse to be removed from their bottles - no matter how much you smile at your guest, crack a couple jokes, or use your old wrestling moves to wiggle the bugger out. Learning to crack open a wine bottle with ease is the first challenge to your wine drinking journey - and its perhaps one of the biggest challenges at that. After all, what’s hold you apart from the wine is the cork itself, right? Before you even reach the cork itself, you must first remove whatever wrapping or sleeve lies on top of the cork, which is called a wine capsule. Usually its plastic, cellophane, or a thin metallic foil with the wines emblem on it, or a more colorful wrap, especially for sparkling wines and champagnes. Whatever the material, it must be completely removed to avoid any contact between the wine poured and the material itself. To do this, most waiter corkscrews and screwpull wine openers come equipped with a small knife made just for this purpose. Ring the knife around the capsule top a few times and then peel it off. If it's a plastic plug, you can usually just flick it off with your fingertips or a knife. After removing the capsule, be sure to take a damp cloth to wipe clean the bottle. Some dust, or even mold, can be hiding behind a capsule atop the cork, so be sure to clean this off to avoid any unnecessary contamination of your wine. But just because a visible mold is on the cork does NOT mean the wine is faulty or corked. It more often than not is a good sign - indicating that the wine was properly stored in humid conditions, instead of dry conditions where the cork shrinks and separates from the glass bottle, thus allowing too much oxygen leakage into the wine. Traditionally, wine capsules aren’t to be entirely removed, but honestly, you can just ignore this unnecessary etiquette. Otherwise, you can buy a fancy foil cutter for around $8.00 to suit just this purpose. Tip: Try each type before deciding which one works best for you. Type #1: The Indispensable, Trusty Screwpull. 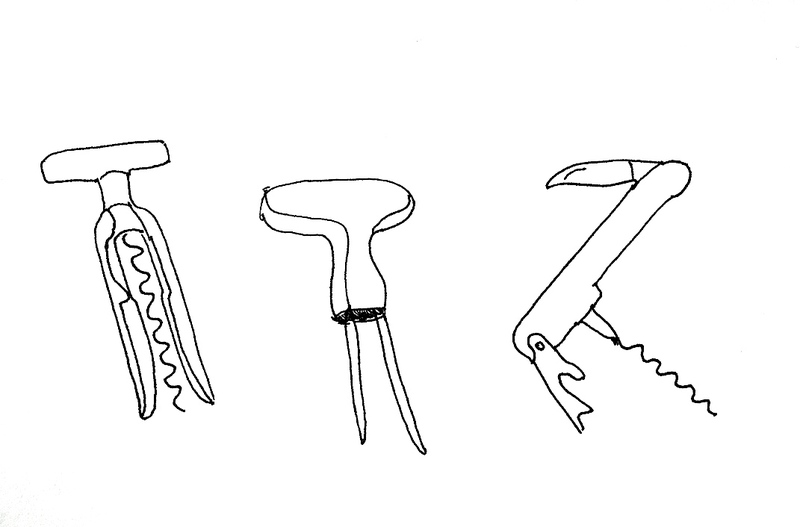 The Screwpull is the common corkscrew for every household. To use it, simply place it until it touches the top of the cork (capsule removed, of course). Insert the pig-tail looking metal piece (called the worm) into the cork in a clockwise direction by holding firmly onto the top lever. The metal will slowly descend into the cork with each new twist of the hand. Keep twisting until the cork pops out of the bottle. To remove it, hold onto the cork and twirl the screwpull counterclockwise. The benefits of the screwpull are simple: it is the easiest corkscrew to use and requires the least amount of muscle. A decent Screwpull, in the twenty-thirty dollar range, will be more the sufficient for the majority of corks you’ll encounter. Type #2: The Ah-So Corkscrew. The Ah-So (from “Ah, So that’s how this thing works!”) is a two-pronged device unlike any other cork screw you’ll find. It works wonders on super stubborn corks that are tightly packed into their bottles, and won’t budge. To use it align the two metal prongs between the cork and the bottle glass, and penetrate them through the slit between, starting with the longer prong first. When the corkscrew head reaches down to the cork, wiggle it a little in an upward motion, and the cork will usually pop out, in tact, between the metal prongs. As mentioned, this is the ideal corkscrew for tight corks, but also for crumbly corks that don’t give other corkscrews enough grip to dig in to, or else otherwise endanger the wine below with bits and pieces of cork that are more likely to flake off with more aggressive twisting and pulling. TIP - if you’ve got a loose cork on your hands - this is NOT the corkscrew for the job. Because there’s no tension between the cork and the bottle, the metal prongs have no leverage to lift the cork up and out of the bottle. You’re better of in that case with just a regular screwpull. The Ah-So Corkscrew sells for around $8 to $10. Type #3: The Waiter Corkscrew. So you wanna impress your date with your wine skills, or just fit the wait-staff crowd at the restaurant you work at? The waiter corkscrew then is for you, the most professional, and respected, corkscrew of them all. The waiter corkscrew looks much like a swiss army knife, with three gadget protrusions that flip in and out of the straight metal base. The first is of course the metal worm, the second is a lever, and the third is a small knife that’s super useful for removing wine capsules in a flash. This corkscrew is the most respected because, after all, it takes the most skill and practice. Clamp the bottle neck between one hand. Then grab the corkscrew from the metal base at the top and gently guide the worm down into the center of the cork by twisting the metal base in your hand. When you’re confident that the worm is riding down the middle of the cork (that’s the big trick here), then you can speed up the twisting motion until the worm has fully penetrated the cork. Then flip down the lever onto the bottle’s lip, and push against the lever to lift the cork up and out. Either a sharp pull or a gentler wiggling out will do.